It’s been speculated that the iPad will at last save the beleagured newspapers and magazines of the world. That may be overstating the case, but if the media giants’ latest moves are any indication, the iPad may finally give them an opportunity to save themselves by tailoring their content for the newest, hottest device. Here’s a look at a few new apps from some of the biggest names in news. That the New York Times has a presence on the iPad isn’t anywhere in the vicinity of a surprise. The publication showed off both its app and iPad-tuned Website back in January during Steve Jobs’s announcement of the device, and the paper’s popped up a few times in iPad demo videos on Apple’s site. The Gray Lady’s app offering is the NYT Editors’ Choice, a selection of news, opinion, and feature articles from the venerable publication, including multimedia such as photos and videos optimized for the iPad. You can easily jump around to different topics such as business, technology, and opinion using the simple toolbar-based navigation, and it’s likewise simple to e-mail articles to family and friends. Plus, since you’re not always connected to the Internet, the app can download and store information for offline reading. NYT Editors’ Choice is free and available in the App Store now; it requires an iPad running iPhone OS 3.2 or later. If you prefer to sample the news from the other side of the Atlantic, BBC News brings you the latest from Auntie Beeb. News stories can be viewed by geographical region or by category, including business, technology, entertainment, and sport. For the multilingual, you can browse in a handful of other languages, including Spanish, Russia, and Arabic. Want a more audio/visual approach? View the wide range of video, including one-minute news summaries. You can even personalize the app to focus on your areas of interest, and, like the Times’s app, BBC News will download content for you to view while you’re offline. 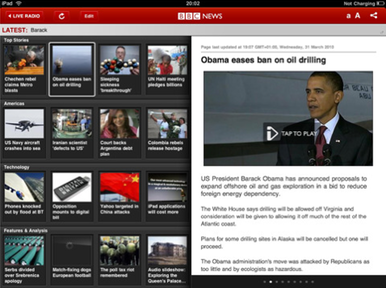 BBC News is available now in the App Store for free. It requires an iPad running iPhone OS 3.2 or later. Navigating the corridors of finance and business? Chances are you’re probably already the kind of person who peeks at The Wall Street Journal on a regular basis, but now Dow Jones & Company has brought the paper to the iPad with The Wall Street Journal app. The app brings you access to all of the Journal’s free content, including top article picks from Journal editors, videos and slideshows, and updated stories throughout the day. You’ll also get the latest market data, including a watchlist that you can customize by adding your own stocks and funds. 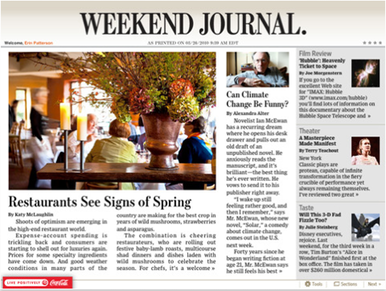 The Journal is also pushing hard to make the iPad a viable avenue for subscribers. While existing subscribers get full access to the iPad app “for a limited time,” the rest of us have to shell out $17 monthly for full access, including subscriber-only content such as the Business, Markets, and Opinion sections. You’ll also get a seven-day archive downloaded automatically so you can browse at your leisure, as well as the ability to save sections and articles to read later. There’s also a My Journal feature that lets you share articles between your mobile device and the Journal's Website. The Wall Street Journal app is available as a free download in the App Store now; it requires an iPad running iPhone OS 3.2 or later. The Associated Press has long pimped its AP Mobile iPhone app, so it’s only natural that it would venture onto the iPad. Hence, AP News: a “breaking news experience” of the latest stories from the press syndicate. In your pursuit of informative coverage, you can browse categories such as entertainment, sports, travel, finance, and the ever popular “wacky” news, and customize which categories you see news from. Because of the AP’s long reach, you can check news from your local papers and broadcasters along with the AP’s national and international coverage. And, of course, you’ll find photos and videos formatted for viewing on the iPad. AP News is available now as a free download from the App Store; it requires an iPad running iPhone OS 3.2.